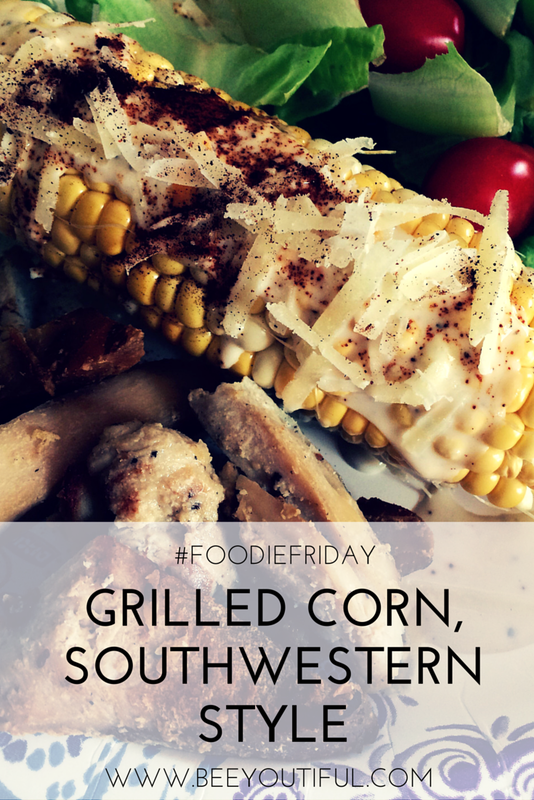 When traveling, it is nice to have a few tasty and quick meals to eat on the fly. 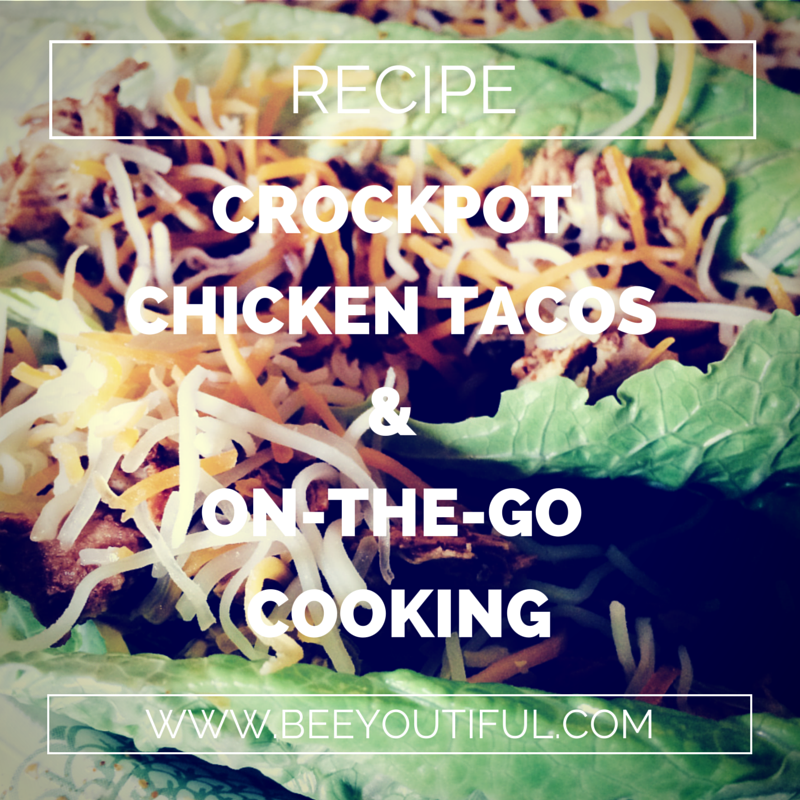 Crockpot Chicken Tacos are a favorite whether we’re at home or on the road, and leftovers (if there are any!) make a great topping for Taco Salad. To make the process easier, I prepare my slow cooker meals before we leave home and then freeze them in large zip-top bags. They travel well this way in a good cooler, and then they can thaw in the mini fridge in the hotel. Clean up is easy and I don’t have to worry about bringing seasonings and extras since they’re already in the bag! Just dump into the crockpot and go. 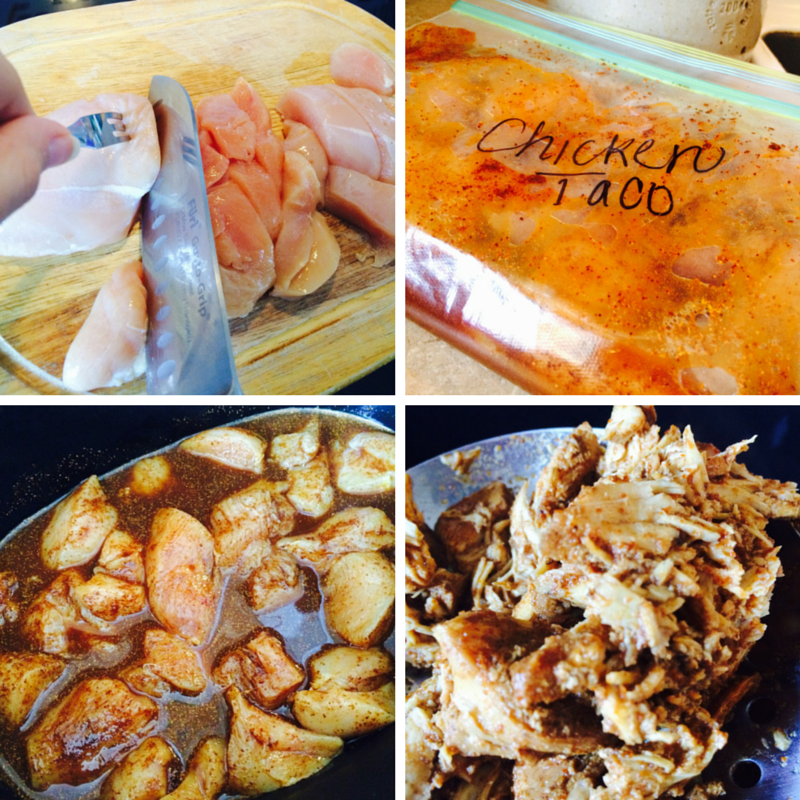 Place ingredients into a slow cooker and cook on low for 6-8 hours. Shred with a fork when the meat is cooked through. We bring either salad fixings for taco salad or taco shells for traditional tacos. Toppings can be shredded lettuce, tomatoes, olives, cheese, salsa, and avocados or guacamole. Buy a set of cheap cutlery and store in a plastic shoe box with a lid (or disposable utensils are nice, too). Don’t forget serving spoons and a can opener. Bring two sharp knives for any cutting needed. Wrap in a thick dishtowel and store safely in the box with the cutlery. Use a small plastic box as a “pantry” with basic seasonings (salt, pepper, garlic, cayenne, etc.) 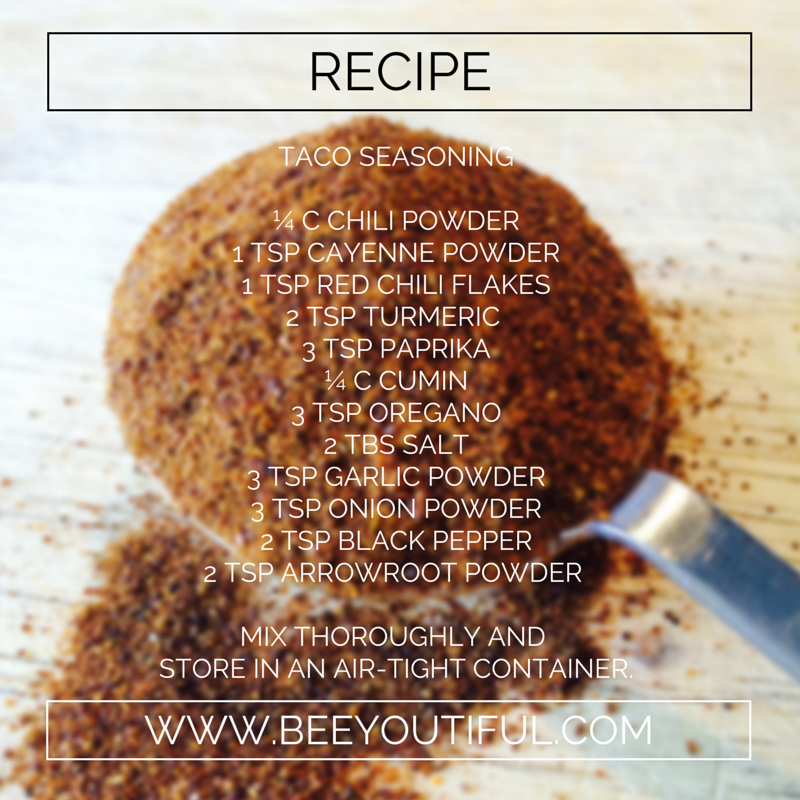 to spice up any meals that might need an extra bit of flavor. A small baking sheet can serve as a tray to prep your meal. The lips around the tray keep any messy liquids contained. A few sheets of parchment paper are easy to pack can be used for meal prep surfaces on a counter or desk and are super easy to clean up and throw away in a hotel room. Stow several dishrags and a small container of dishsoap in a large zip-top bag, along with several smaller plastic bags. Make sure to bring extra bags or storage containers for any leftovers or to stash damp dishrags. Bring along a good supply of disposable plates and paper towels! What’s your favorite travel-friendly cooking tip? In the past few years we have been bombarded with news of some dangerous viral outbreak or another. Seeing images from around the world, images of civilians wearing masks to protect themselves and holding masks over the faces of the young, have become more common place. Perhaps you remember SARS and Avian Flu. Now the most recent strain of influenza A is H1N1, otherwise known as Swine Flu. There is some alarm among experts that H1N1 could be “the one” that causes a pandemic in our generation. Regardless of whether it is Swine Flu or some media proclaimed super-scary flu of the future, the best defense is a good offense. We at Beeyoutiful firmly believe that it is the responsibility of individuals to educate themselves on how to best protect the health of their families. With that belief and goal in mind, we have researched extensively what tools are the very best to use to protect and defend against viral invaders. How can a virus kill someone anyways? Autopsis of victims of Avian Flu, SARS and the deadly Spanish Flu of 1918, which killed an estimated fifty million people, revealed evidence of destroyed respiratory tracts. This suggested that the flu victims had been killed by their own immune systems, not from the flu itself. The immune system response suspected of being responsible for killing the victims is something called a cytokine storm. Cytokines are the type of white blood cell and are a normal and essential part of a healthy immune system. T1 cytokines are a particularly aggressive part of this segment of immune system super-heroes and typically are very crucial. Some viruses, such as Swine Flu, can cause these cells to over respond and the T1 cells actually become deadly to the body. Just as insulin is normally released in proportions to the amount of sugar intake, so cytokines normally respond in proportion to the assault on our bodies. However, just as the release of too much insulin in the body can result in death, so an overwhelming assault by T1 cytokines can cause the lungs to fill with fluid causing a person to drown. For those of us who are accustomed to reaching for the nearest available immune boosting super power when we come down with an illness, I have bad news. A lot of our traditional favorite supplements and herbs can potentially cause more harm than good when dealing with the risk of a cytokine storm. Little attention is given to the balance necessary between the T1 and other cytokine cells in order for our immune systems to operate safely. Since the T1 cells are more aggressive front runners than the other T cells, supplements that directly support their production are among the most popular for quick recoveries. 1) Take BerryWell liberally as a preventative every time myself or family members go out in public. 2) Discontinue giving to any individual that exhibits symptoms and switch to other broader and safer immune boosting treatments. Is anything safe to take or do we just take our chances? The good news is that there are several powerful and effective products out there that are known for their support of balanced immune system production. This makes them not only safe to take, but also ideal aids for the body to prevent and even treat Swine Flu as well as other variants of flu. Below is a list of products I will personally be using as both a preventative and treatment should it be necessary. Although most of us realize that our bodies need this essential vitamin, it is one of the most under-acknowledged resources for combating viruses. There is an amazing body of documentation to prove its effectiveness not only in boosting the body’s ability to resist the flu, but also in powerfully treating it. It might just be the single most important supplement you can take to equip your body to face off with Swine Flu and walk away the victor. If exposure to sunlight is limited, like during wintertime for example, 4,000-5,000 IU’s per day would be appropriate for most adults. If you weigh significantly more than the typical person, you may need to double that dose. For children the dose can be halved. For supplemental purposes, I would highly recommend using the D3 vs. the D2 form. 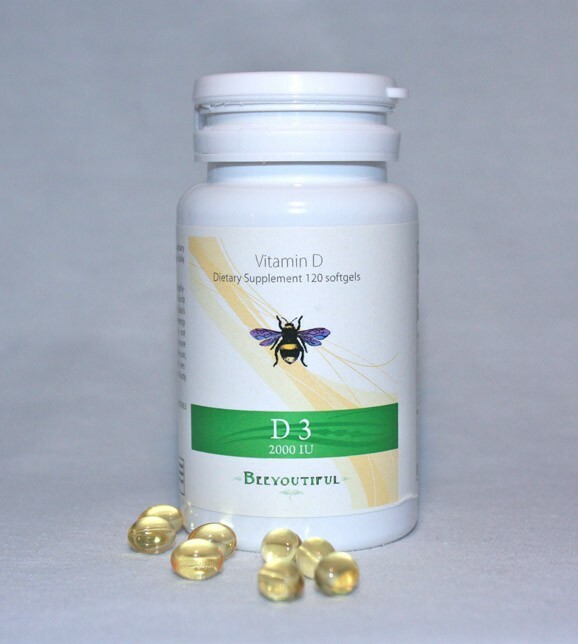 D2 is the more common and readily available version but is not as easily activated within the body as D3 is. Vitamin D can be used therapeutically to treat the flu but it is also important to understand that, if you are taking the above doses of vitamin D, the chances of you getting the flu to begin with are very remote. The old saying “An ounce of prevention is worth a pound of cure” could not be more accurate regarding this treasure of a vitamin. The daily dose of vitamin D you would use to treat the flu would be 1,000 IU per pound of body weight (round down, not up). The dose would be taken once a day for no longer than three days (Note: This could be a very large dose if you are a large person.) This is the dose that Dr. John Cannell, the founder of the vitamin D Council, has been using very successfully for a number of years. Rapidly gaining recognition for their multi-faceted and universally beneficial properties, probiotics are considered absolutely essential in any immune system alliance. Most of us are familiar with these beneficial bacteria because they are found in yogurt. Cultures around the world have used these amazing “good” bacteria to culture, safely preserve and leaven a variety of foods and beverages like kefir, kimchee, kombucha, sourdough bread and sauerkraut. Probiotics are the cornerstone of a healthy gut and, subsequently, of a healthy immune system. Although one can find a limited amount of this bacteria in commercially manufactured yogurt, it does not contain enough strains or enough live bacteria to patrol the yards and yards of digestive tract and war with any offensive bacteria found there. Since most of us have not grown up with a lifetime of eating live cultured foods, we need a more powerful and immediate source. Probiotics are readily available these days in wider varieties than ever before. They come in tabs, chews, loose powder, regular capsules and enteric-coated capsules (a special protective coating on the capsule to get it through the damaging stomach acids and into the gut, safe and sound). They can be found in single strains, like Acidophilus, and multiple strains from a variety of sources. When taking a probiotic supplement, always determine the minimum guaranteed bacteria count, as well as the recommended storage instructions. 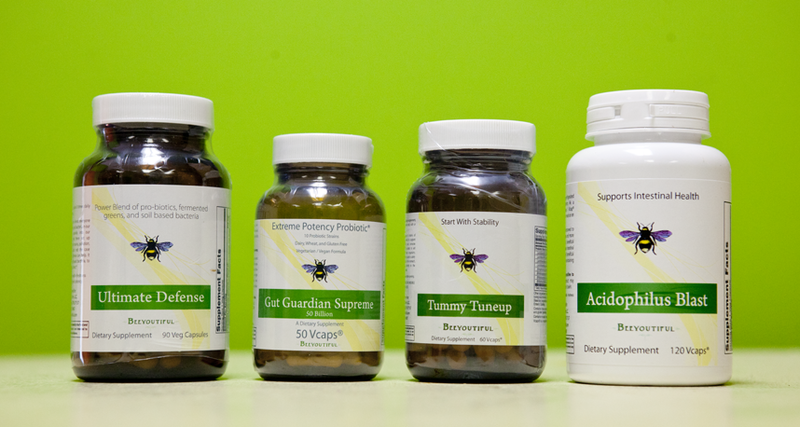 Tummy Tuneup is an enteric coated 8 strain probiotic available through Beeyoutiful. It has proven itself again and again to our staff and customers. Tummy Tuneup is an ideal choice for delivering the maximum benefit to the gut. Another Beeyoutiful product, Ultimate Defense, has a large variety of bacteria and is very beneficial to take on a daily basis, or specifically as a preventative gut-based immune booster. Here is a quote from a study illustrating how probiotics aid in inflammation control and a balanced, healthy immune response. Probiotics are dietary supplements known to reduce or alter inflammation and inflammatory cytokines. Histological analysis revealed that edema, inflammation and vacuolization as well as polymorphonuclear leukocyte infiltration in the lung tissue was significantly reduced in the probiotic treated group. Bacterial translocation was significantly reduced in the probiotic treated group compared with the other groups. As a result of this, reduced proinflammatory cytokines and systemic inflammatory response was observed. Colostrum is the super nutrient-dense, pre-milk substance that mammals produce for their young before a normal milk supply sets in. Few things in nature are known to have such amazing life sustaining properties and seemingly magical immune building properties as colostrum. When dealing with these potentially deadly flus, it is important to insure that the balance of T2 cells will be produced in proportion to, if not in excess of, the T1 cells while the immune system is attacking the offending virus. Studies show that nothing does this better than colostrum. Researchers in Australia set out to learn if dried bovine colostrum protein (a popular supplement with athletes) had the same ability to stimulate cytokine white blood cells in humans that the fresh colostrum does in cows. In the study, researchers saw that the T2 “retreat” cytokines were activated and the T1 “attack” cytokines were suppressed when measured 6 hours after administration. Multiple studies show colostrum to be an incredibly vital product to have on hand if there is any danger of a cytokine storm related illness. It has no known side effects and is very safe for even small children (capsules of the dried powder can be opened into food or drinks). Many of us know of aloe’s healing properties having used it by slapping a fresh cut of aloe leaf on sunburns and feeling the instant relief. Aloe is also an amazing miracle worker and support for the body from the inside out. Aloe Vera is chock full of vitamins, minerals, enzymes, amino acids, and micronutrients that can help the immune system to be strong and resilient against infection. Consuming Aloe Vera on a regular basis provides your immune system with the extra boost of nutrients it needs in order to perform at a superior level. It also provides you with antiviral, antifungal and antibacterial protection. Aloe Vera is known for its synergistic properties, meaning all of the nutrients it contains work together to bring about the desired result of a strong and balanced immune system response. What makes aloe particularly good to take in an antiviral regimen is that it, like colostrum, directly supports a balanced and therefore safer immune system response. 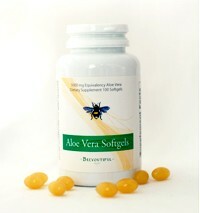 Beeyoutiful carries Aloe in concentrated form in gel capsules. Aloe is safe for children to take and the capsules can be cut open and squeezed into yogurt or a smoothie. Excess Aloe Vera can cause diarrhea, so if this occurs simply reduce the quantity or frequency. Perhaps no plant has been more treasured throughout history for its incredible flavor and culinary contributions than garlic. As anybody who has eaten a clove of raw garlic will tell you, there are few things that come close to the incredibly powerful and pungent flavor of garlic. This little powerhouse has also been documented to have antiviral, antibacterial and antifungal properties and has been used medicinally for thousands of years in many countries around the world. Several studies have shown that high doses of garlic help to regulate cytokine response. What constitutes a high dose is difficult to define because garlic potency varies from one variety to another, from one region of the country to another, and from one harvest to another. If your stomach and taste buds can tolerate it, the most beneficial way to utilize garlic is to eat it raw, ideally from an organic or all-natural, pesticide-free source. For those of us that prefer a supplement to a burning tongue and watering eyes, there is good news. Allicin is a component of crushed/raw garlic that is considered incredibly beneficial but is also highly unstable. For years the only way to get it was by eating fresh, crushed garlic. However, a couple of years ago they figured out a way to stabilize allicin so that it could finally be offered in a supplemental form. Although garlic in just about any form will be beneficial in some way to your body, if you can find a stabilized allicin source I highly recommend it. Beeyoutiful carries an aged 100:1 potency odorless garlic product that has been used with great success by our customers and staff. An added bonus to odorless garlic is that you don’t have people crinkling their noses as you walk by or spouses refusing to share bed space with you due to the aromatic fumes wafting from your pores. Fresh garlic can be a challenge to get into small children orally and the gel capsules are not much better. For babies or small children, I highly recommend a garlic poultice as an effective way to get the benefits of garlic into small people’s bodies (see side bare for instructions). A note of caution before consuming gigantic quantities of garlic: There is risk that, if you have a bleeding or clotting disorder, very VERY large amounts of garlic could exacerbate the problem or cause some drug interactions. Individuals on blood thinners should be especially aware of this concern. In response to the concerned questions the staff at Beeyoutiful have received, we have put together a convenient and significantly discounted Anti-Flu package. Included in this package are what we believe to be our most effective and beneficial products to arm and protect you and your family from any potentially dangerous flu. It contains BerryWell, Vitamin D3, Odorless Garlic, Tummy Tuneup, Ultimate Defense and Colostrum Transfer Factor. Please remember that the information shared in this article is our personal opinion based upon hours of personal research. We do not in any way intend for this to take the place of your personal research or the advice and counsel of your doctor. We hope instead that it is an encouragement and a starting point for you to educate yourself on the best ways to protect your family. I look forward to Easter shopping-but not for jelly beans and chocolate rabbits. What I crave are those cheap-plastic, pastel buckets. In my house, they have a vital purpose far beyond holding candy-filled fake eggs and artificial pink and green grass. Since we inevitably employ them several times a year, I stash the little pails around the house so they’re always near at hand. That way, when some family member catches a stomach bug, the buckets are ready to catch the results. A variation on this preparedness scenario doesn’t require Easter buckets but lots of tissues. It can also mean dewy bedroom walls from an all-night run of the humidifier when a cold strikes. A worse variation is bronchitis or respiratory flu. I must admit, it’s the sick times that make me question the wisdom of having such a large family because our team goes down for so long by the time a bout with illness runs through all ten of us. But thanks now to Beeyoutiful’s Ultra Immune, I have fewer and fewer times to wish down our family size. These extraordinary black pills could win a look-alike contest for licorice jelly beans, but they’re even more powerful at knocking out and preventing health problems than jelly beans are at causing them! Ultra Immune is jammed with anti-viral, anti-bacterial, anti-fungal, anti-parasitic, anti-microbes-in-general ingredients, the superstar of which is allicin. The most potent component of garlic, allicin is the main reason garlic has such remarkable health properties. In the ounce-of-prevention-worth-a-pound-of-cure department, your best strategy is to take one or two gel caps every day when you’re feeling fine. Chances are, you’ll stay that way, even during cold and flu season. 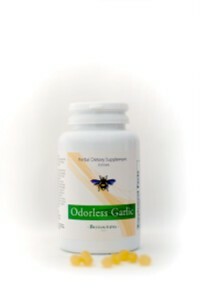 Or if you prefer, pop two capsules the minute you start to feel sick, and you’ll likely cut your down time dramatically. Even at the onset of illness, Ultra Immune gives your body the extra fight it needs to get well sooner. I’m my own best example that Ultra Immune works. The past couple of years have brought many hard situations, and the stress has challenged my vitality as never before. With my 50th birthday only two years away, I realize youth is no longer here to help me through. As a result, hardships got me so run down, I caught every cold and virus that found its way into the family. I even had a bout-unusual for me-with bronchitis. Then I started taking Ultra Immune every day. Once on the regimen, the difference in me showed immediately. My children have had colds, sinus infections, bronchitis, and a lovely stomach bug or two, but I’ve sailed through each without even a hint of sick feelings. Now that mother has done her duty as family guinea pig, it’s time to get the whole crew on Ultra Immune. I’ve dabbled with alternative medicines for a number of years, but confusion, lack of money for some of the fancier treatments, and a lack of consistency because of my houseful of daily work have slowed me down. Nevertheless, I’ve tried. I’ve imposed raw garlic on older children, slathered essential oils-both fragrant and odious-on little people, and sampled sundry health diets and foods. While all have their good points, I’m honestly just a tired, getting-older mommy looking for an easy fix. Thankfully, Ultra Immune is both easy and effective. Call it my “silver bullet” to ward off Easter buckets, but there is solid science and a rich history of natural medicines behind Beeyoutiful’s amazing black pills. Cultures as far back as the ancient Egyptians and Chinese knew the health benefits of garlic. The catch is, though, that you must eat it in the right form, or it just won’t work. If you crush it, that “magic” allicin can be destroyed in as little as ten seconds. Slicing the garlic better preserves its healthfulness, but you still must eat it quickly to gain the benefits. So what, exactly, does allicin do that is so helpful? Researchers have found that allicin lowers both bad cholesterol and blood pressure, thus helping to prevent heart attacks and strokes. It also provides anti-cancer, antioxidant, and anti-microbial assistance. And along with being the hero for preventing and healing colds, strep, and flu, allicin even reduces vulnerability to more frightening diseases like tuberculosis and SARS. If you want this incredible ally on your family’s side, you have to look carefully for it. It does not come “ready made” in garlic. Allicin is actually composed of two substances, allinase and allin, which in the right conditions combine to form the miracle worker. Fresh garlic will not necessarily contain a high level of allicin. Dried garlic powder used for cooking contains both allinase and allin (the allicin precursors), but not necessarily allicin. Garlic oil doesn’t have it at all. If you think your “garden variety” dietary supplement is an answer, read the packages very carefully. A label that offers “allicin potential” suggests that the manufacturer is just guessing at the value of allicin included. Not only that, the term “allicin rich” is meaningless. It says nothing about the actual amount of allicin in the product. If the label lists only the “allin amount,” you may end up with no allicin at all because allin content is significant only if it can associate with sufficient allinase enzyme to produce allicin. What you want to see on your allicin supplement is the name AlliSure®. This is allicin powder extract, stable and ready to be used by the body. No further allinase conversion is necessary. AlliSure®-the allicin source in Ultra Immune-is produced through a patented process which formulates allicin liquid from raw garlic. The liquid is spray-dried to produce allicin powder. You also want to see on the label the actual amount of allicin contained in each dose, expressed in micrograms. 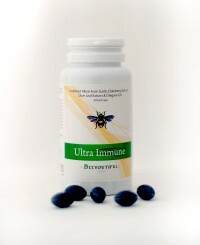 Ultra Immune contains an optimum 12.5 micrograms of stabilized allicin. Ultra Immune doesn’t stop with allicin to help you fight off the inner bad guys. It also contains black elderberry extract which, according to studies, helps flu patients recover in 3.1 days compared to the average 7.1. Ultra Immune adds the power of olive leaf extract, yet another wonder for its ability to interfere with critical amino acid production for viruses. The extract is known, too, for fighting the common cold, flu, cold sores (herpes), ear/eye/nose/throat infections, impetigo, pink eye, parasites, and a host of bacterial, viral, and fungal infections. As if that’s not enough, Ultra Immune offers the benefit of two powerhouse essential oils. Rosemary oil serves as an antiseptic for flu viruses and colds, and helps regulate blood sugar and blood pressure. It is also used to heal ulcers and canker sores. Ultra Immune’s oregano oil (my personal favorite of all the essential oils because it fights so many bad things) destroys antibiotic-resistant strains of bacteria and is even considered effective against anthrax. Other germ warfare equipment includes ImmunEnhancerTM AG, a substance derived from Larch tree bark (a fast-growing type of pine), that can help speed the immune system’s response to undesirable organisms so effectively that it is often compared to Echinacea. 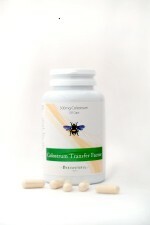 IETMAG has also been shown to promote the growth of beneficial intestinal bacteria. Perhaps the best aspect of Ultra Immune gel caps compared to any alternative is that there is no garlic taste or smell although the oregano oil fragrance is still there. That might make it a bit hard to get Ultra Immune into a baby, and pregnant mommies should be careful about using Ultra Immune because rosemary oil carries with it the potential for miscarriage. However, if the rest of the family is taking Ultra Immune, many of the germs that try to take over will be stopped in their tracks, so even the unprotected won’t succumb. I’d still recommend keeping a few Easter buckets around for the stray germ that may sneak through your family’s protection network, but if you start putting Ultra Immune into your loved ones, those buckets will collect a lot of dust between service calls! Nancy Webster is a home schooling mother of eight and an avid researcher on health and nutrition.